At Floyd’s Welding Service, we have the capability to build tank truck set-ups on your truck, or we can help you locate a suitable truck through our network of vendors. We also repair existing tank truck set-ups, give older units much needed face-lifts, and troubleshoot issues that prevent your equipment from functioning at peak performance. Our tank trucks are used primarily in the oil industry to haul freshwater or saltwater to drilling rigs & haul BS from tank bottoms. 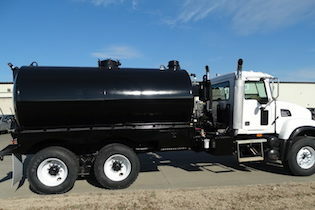 Some important features of our tank trucks include: a 3″ water cooler Masport pump, so operators can load and unload fast; a 3″ Bowie pump, which is great for thick BS; tank insides are sandblasted and given 3 separate coats of Carboline coating to extend the life of the tanks; 1/4″ double pads for tank mounting, to protect the tank from having holes ripped in it; and, D.O.T Roll bars protect the manways. Floyd's Welding Services provides tank truck repair and welding services to clients throughout Olney, Vincennes, Effingham, Salem, Fairfield, Louisville, St. Elmo, Griffin, Crossville, and surrounding IL and IN communities.